Some hippie-dippy British trad-rock Celtic goodness circa 1970 from Fairport Convention on this Thanksgiving Day, 2009 - written by Dave Swarbick and Richard Thompson - somehow seems fitting in the pre-turkey mists of morning. Fired Up - Ready to Go on Climate Change? That President Obama will travel, after all, to Copenhagen next month to take part in the United Nations climate change conference is huge news in my house - or at least, in my daughter's high school environmental activism club. There are those who argue that the U.S., even with a Democratic President and Congress, is not ready to come in from the cold on climate change in a formal manner, that the Obama Administration has moved too slowly in joining international action. But the actions of the President speak loudly, particularly to young activists who very often drive this issue with more passion than their political professional elders. So Obama's trip to Copenhagen, where he will speak at the beginning of the conference and then zip over to Oslo to collect his Nobel, is important to the environmental movement in the U.S. I know that I was hearing a bit of "why should we bother?" after a long day of telephone-banking to Congressional offices - but that was when the young activists believed the Administration would skip Copenhagen. Welcome too is the small bit of policy the President will bring with him: "a tentative promise to reduce production of climate-altering gases," the first time the U.S. has ever entered in the arena of concrete emission numbers. According to John Broder in the Times, Obama "will tell the delegates to the climate conference that the United States intends to reduce its greenhouse gas emissions “in the range of” 17 percent below 2005 levels by 2020 and 83 percent by 2050, officials said. No American administration has ever delivered even a tentative pledge on emissions reductions because Congress has never enacted climate legislation or approved an international global warming agreement with binding emissions targets." But the White House is doing something else as well: firing up the portion of the activist base that spends long afternoons calling Congress about climate change. I use a lot of music web services but I don't like to invest in this sector. Nonetheless, it's an area that I spend a lot of time thinking about. I've written endlessly on this blog about the music web services I use, why I use them, and where I think the music web is going. The most interesting music web service to me has been audioscrobbler (aka last.fm). I'm not all that interested in last.fm as a social network, but I am obsessed with it's value as a data asset. I report all my music listens to last.fm via the audioscrobbler technology and it has built a deep data asset on my musical listening habits (and therefore musical taste). , one of the best tech bloggers around. If you look on the lower right-hand side of my blog layout, you'll see a chart that's tied to the last.fm API - click on the blue arrows and you can scroll through the recent faves (the ones I've listened to via iTunes and on my iPod , anyway). Warning: acres of classic rock. Ponte Vecchio shutters, originally uploaded by Tom Watson. Another picture from my brief Florence sojourn - this probably the most-photographed structure in town: the Ponte Vecchio. 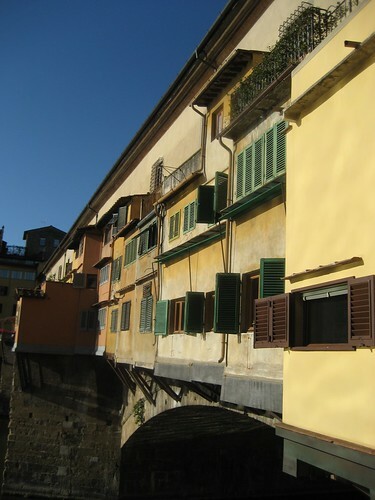 This shot is a view of the back windows of the gold shops and tiny apartments above the Arno. It was early, so the light was terrific. The bridge dates to 1345 and was famously spared by the retreating German Army in 1944, when all the other Arno bridges were destroyed. I'm tempted to say that the United States is plainly unable to cope with the economic crisis in a serious way. The barriers are philosophical, procedural, and constitutional. So long as economic thinking is mired in a world that disappeared with the collapse of the Bretton Woods system in 1971, so long as any action requires 60 Senate votes, and so long as political capital erodes from the start of a fixed four-year presidential term, we're stuck. It's been pretty clear for a while that the U.S. needs a major jobs program, that unemployment will linger (or worsen) for years, but 'business reporting' in this country isn't up to the standards of TMZ.com - and we seem to lack the political will. James Galbraith almost throws in the towel in this rant, and he jabs both the President and Congress for their Wall Street ways. Maud writes in the LA Times about how real people and events have "morphed in incremental but ultimately fundamental ways" in her upcoming novel, which we will promote heavily herein. On the downside, Ms. Newton's must-read literary headquarters has been hacked again the forces of Sauron. But we hear there a wily code wizards working on it (though we remain puzzled, both about our over-use of first-person plural and the sudden Tolkien metaphors). Wow. What a film. What a story. I became so emotionally involved that I had to stop the film, my heart was breaking so deeply. Any artist who's experienced positive audience reaction, who has felt that electric buzz when it all lines up and flows can appreciate what Lips and his best friend/bandmate Robb Reiner still crave as they enter their fifties. These two have never given up, and remain committed to their original vision, forged in their teens. Inspiring, moving, gut wrenching. My friends were right: I completely identified with Anvil. Our blogging buddy Dennis Perrin as a great review of Anvil up. I have to see this. Also good news: Dennis plans to return to stand-up comedy in NYC. When we learn the details, we'll pass them along here. Meanwhile, his videos are almost always dark and sometimes hilarious.